The potential of the internet and the digital world altogether is now unraveling at a fast speed. There are so many things we can do now, including selling online. This is evident by a lot of online shops sprouting on the internet, and many people find this a blessing because it is so convenient and often reliable. Often times, online shops use WordPress since it has a lot of plugins, extensions, and other add-ons that can support the main function of an online shop — to showcase products, provide adequate information to potential customers, as well as have the capacity to actually conduct a transaction online i.e. being WooCommerce compatible. Because WordPress is a reliable website building content management system for websites, many developers think it’s best to develop beautiful and functional themes for WordPress users, even for online shops. 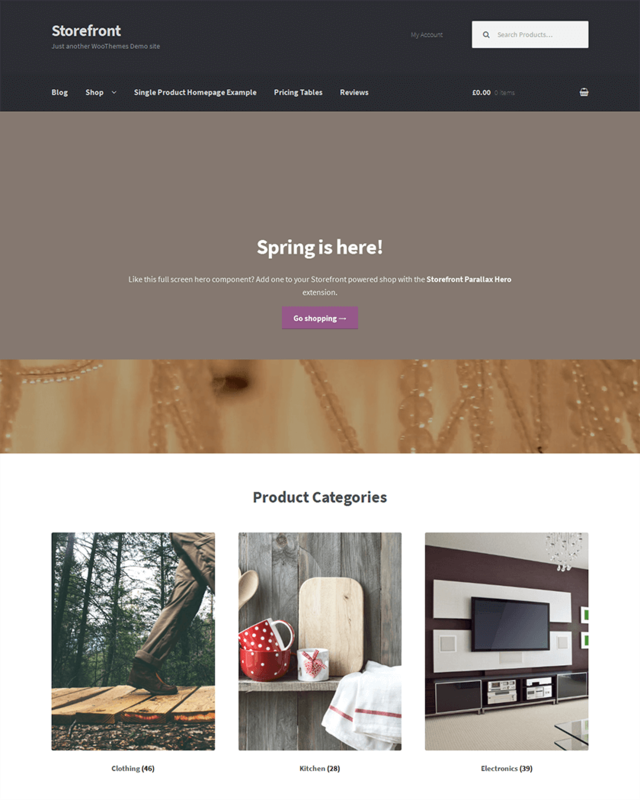 To help you sell whatever product you want to sell, may it be fashion products, lifestyle products, tech, beauty, or anything under the sun, we have compiled all the best, functional, and reliable WooCommerce themes that you can use for your online shop. Let’s take a run-down of the Best WooCommerce themes of 2017 out there for online shops. Flatsome is one of the top selling WooCommerce WordPress themes out there, but it is more proud as being a multi-purpose theme. There are a lot of things that Flatsome offers online sellers aside from being multi-purpose, including the freedom to customize, an interface that actually boosts selling, an up-to-date design, and many others. Although Flatsome is WooCommerce-ready, it is not limited to just online shopping. It can be used as company website or simply a portfolio for freelancers as its design can fit any purpose. The user has freedom to customize Flatsome however, he or she wants to through the theme’s Live Page Builder and Live Theme Option, which allows the user to make adjustments visually and with ease. The interface is easy to navigate for users, making it easy for them to check products and quickly buy. The designers made sure to keep making improvements to the theme as well, ensuring that there will be no glitches experienced. 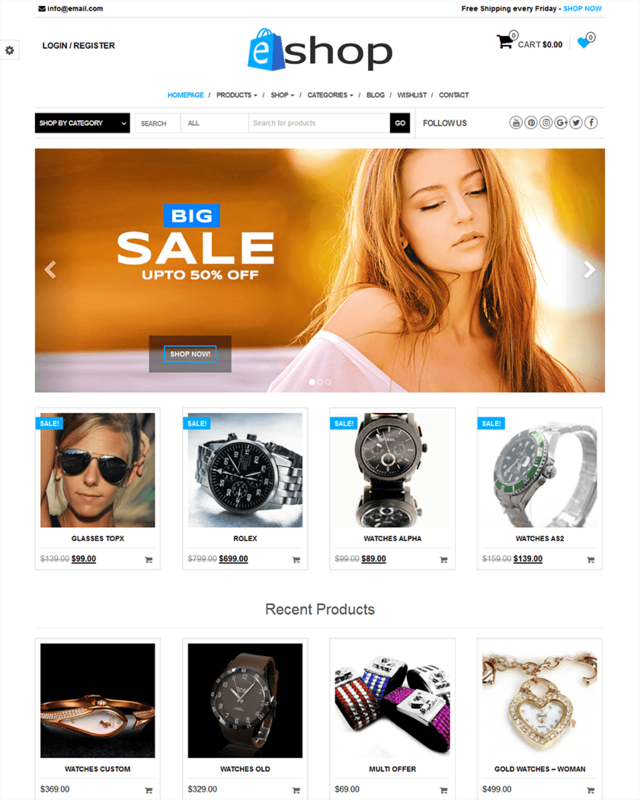 The Retailer is a professional theme for online sellers. Although the design can be used for a company website, it is perfect for online shops as it is easy and fast to install, allows for a wide plethora of products to sell, makes payments easier, and allows selling to any part of the world with convenience. The Retailer has a nice interface that even beginners can enjoy. The designers created video guides to ensure that users can navigate throughout the customization process. What makes The Retailer unique is that tangible products are not the only ones that can be sold. It supports the selling of digital products such as e-books, music, and digital designs. Payment software is built-in, too, and there are several payment options supported by the theme such as cash, card, checks, and cash on delivery. In addition, the theme can help calculate fees and collect taxes as well, allowing the user to get customers from any country. Bazar Shop is definitely made for online shopping. It has so many features that are necessary for online shopping, and somehow, all these features work. The main features that it has for the interface are the logo, widget area and cart tab, top area that includes register links and search bar, navigation menu for easy access of other products and pages, boxed or stretched layout and custom background uploader, header and slider, sidebars, page content, and of course, the footer. These main features, of course, are present in most themes, but the moneyball goes to a tiny detail that Bazar Shop definitely did not forget: a custom ribbon. The custom ribbon is what most online shops need to identify a specific product. It is most commonly used for discounts. However, it also has other features that are truly made for online shopping: a wishlist feature, a compare feature, even a share feature, and a catalog mode. 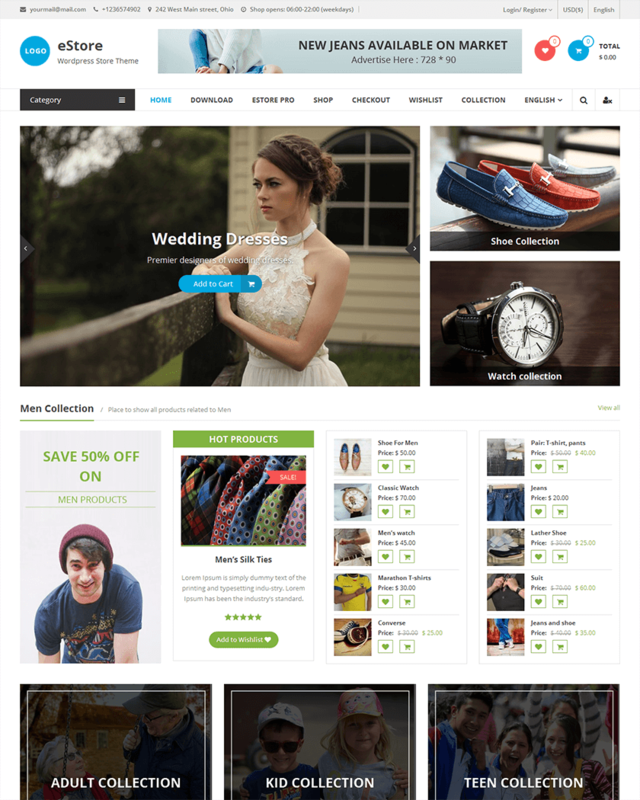 Shopkeeper is easily one of the most modern WordPress themes designed for online shops. Its main highlight apart from its impressive default design is that it is very customizable. It even has pre-built page layouts depending on the preference of the user. It has unlimited header styles, a lot of font options as well as colors. For its latest version, users can now get more fonts from the Adobe Typekit Add-on, so there are more options for the creative user to rebrand and just be artsy. It has a responsive and speedy design, making it easier to catch the attention of visitors from any device. Because of the design’s versatility, it is not limited for the purpose of selling online. 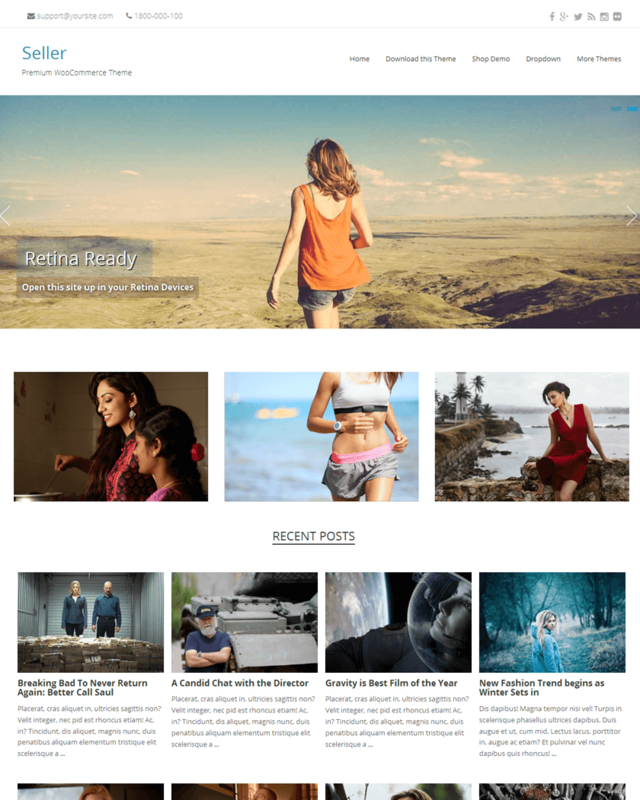 Rather, you can apply this theme for simple blogging and even portfolio creation for artists. In addition, it has reliable and friendly support from designers, in case you are having a hard time with your online shop, making sure that your business will run smoothly. Fashion Gaze knows what online fashion shops need when they build their own website, and the said theme did just that. 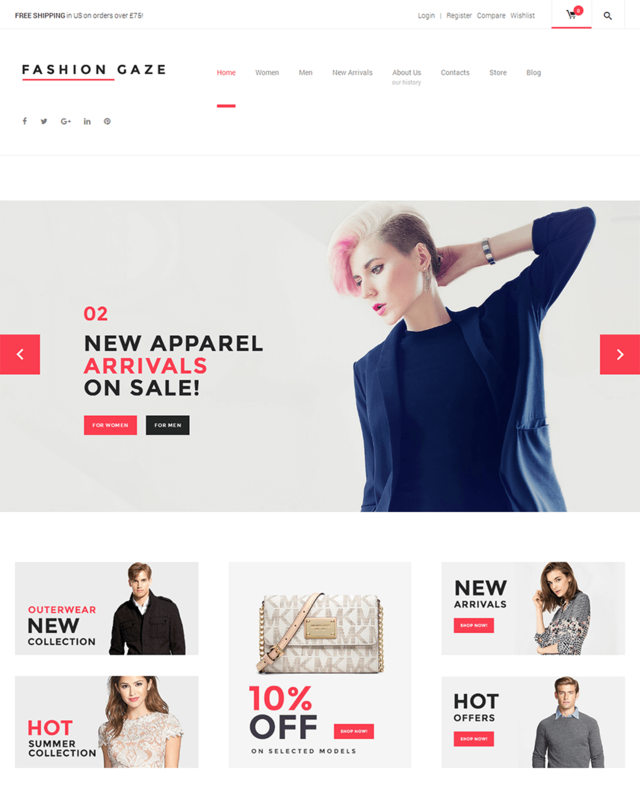 The design is clean, crisp, and highly functional for the needs of an online shop selling fashion products. First off, it is easy to use both for the seller and the customer. The seller will find Fashion Gaze easy to install, while the customer will find it easy to navigate around the site due to a distraction-free interface. The only frills are the products. In addition, the user can customize the site through the WordPress Live Customizer that allows the user to see the changes live before saving them. This customizing time since the user doesn’t have to keep loading his or her site to see minor changes. As it was built with Bootstrap, the design is guaranteed to be highly responsive potential customers can literally shop on the go with their devices. As for the products of the seller, potential customers will find it delightful that they can sort the products so they can easily filter out what they really like. Adding to this experience will be the product categories tab and the product carousel widget. Chef Plaza is created for a specific niche of online sellers and shoppers: selling food online. 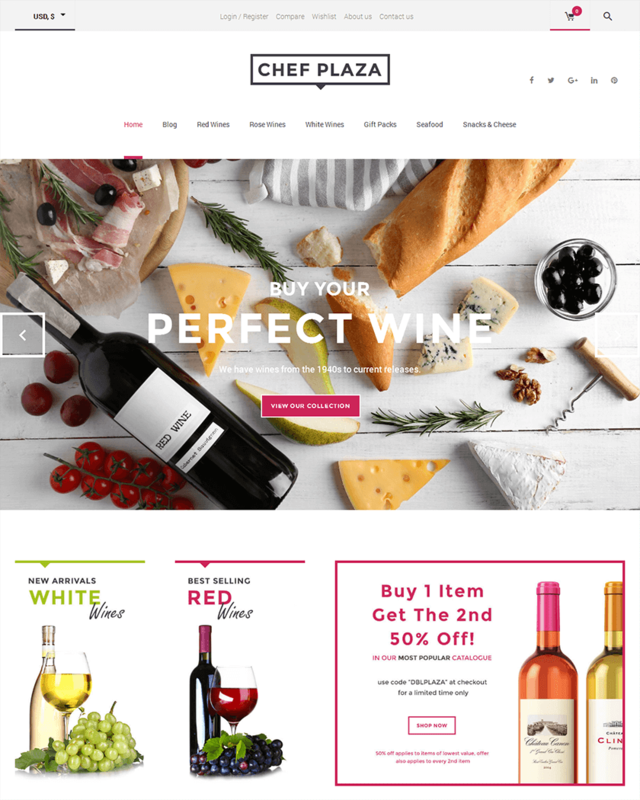 Just like most of the WooCommerce themes out there, Chef Plaza is designed to be easy to use with product tabs and categories, product sorting, even a wishlist and compare feature, and the standard sidebars and fullwidth layout. What makes it unique is that it is powered by TemplateMonster, a plugin that allows for extra customization on how products are presented on the site. This actually includes the wishlist and compare feature, but aside from that, the plugin allows you to put banners and even ratings on the product you are selling. It’s a good and effective way to highlight certain products, making them stand out from all your regular products. The theme also has built-in custom widgets such as the Simple Slider, post carousel, and social media widgets that allows for a wider audience reach online. Another plus for Chef Plaza would be its 24/7 friendly support, so you are sure that when you use Chef Plaza, issues will be resolved quickly. Organica is very specific to its taste, too, as it was designed for selling food and cosmetics or anything remotely about nutrition, but its versatility can most certainly accommodate other products. The design is clean and sleek, but the features it offers are mostly the same as the good WooCommerce themes out there. It is designed to be easy to use, but if there will be problems experienced, users will find the 24/7 support convenient and extremely helpful. As such, beginners need not fear using a very professional-looking design. It has product sorting as well as product categories and tabs, which ensures that customers have breezy shopping experience through the site. The design also has a wishlist and compare feature, which adds to the convenient shopping experience. It has all the custom widgets that are good to have for a professional online shop, including post carousel, social media, Simple Slider, and a newsletter sign-up. As the name suggests, the Computer Store is designed to be WooCommerce theme for tech products. However, it can be used for any product, depending on how the user customizes the site. And the site is pretty customizable, too. It is fully editable with custom post types and formats for standard posts with texts, a quote, an audio upload, a video upload, and of course, image uploads. Users can also customize the typography with over 600 fonts to choose from through Google Fonts. There are custom widgets for the user’s disposal, including widgets for social media and product reviews. The theme itself also has multiple color options for the benefit of the user. Other features include a back-up, being SEO-ready for a strong online footprint, and a lifetime of free updates. Computer Store is really a straightforward and simple WooCommerce theme for online shops who don’t want unnecessary frills and distractions. GoodStore is a haven for online sellers who want to stand out in a sea full of online shops. 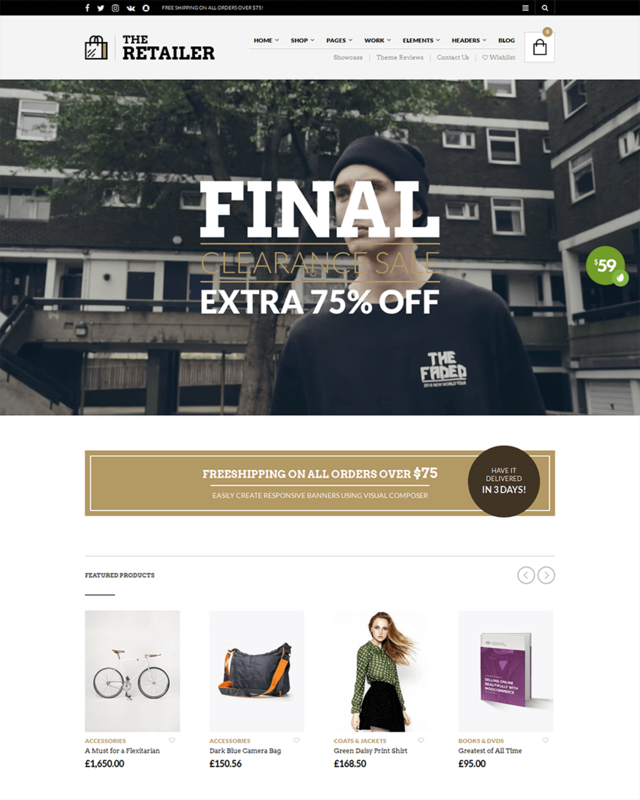 This WooCommerce theme is a good step for those who want to immerse themselves in online shopping yet want to become a unique shop. GoodStore makes being unique a possibility with its 22 amazing layouts that users can choose from when building the site. The customization doesn’t stop with the layouts, too. 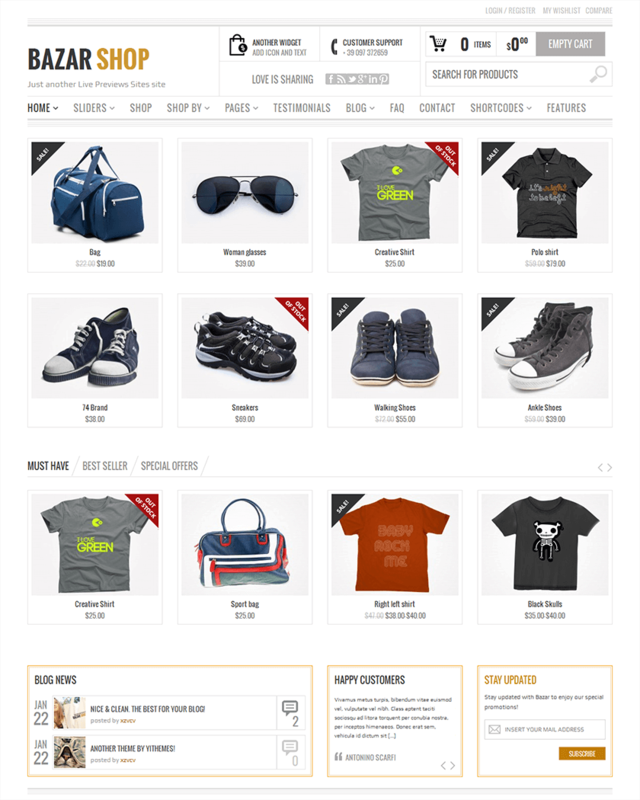 Users can choose the colors and overall style of their shop. It is also pretty easy to install as the designers included a demo content which is perfect for beginners. Other features include the theme being SEO optimized so the site will be easy to look for online by use of tags, multi-lingual as it supports 14 languages, and responsive and even retina-ready so the shop will look good in any device. The support team is also known to be extremely helpful, and updates for this particular theme are guaranteed to be easy to install. Oxygen is a minimalist WooCommerce theme that does exactly what it names suggest: gives the potential buyer a lot of breathing space. Its interface is clean, modern, and sleek. The grid for photos are all proportionate, making it impossible to strain the eyes. The Oxygen theme is perfect for the fashion products. It has a feature that allows for a Lookbook feel, and it even has a quick view feature, an interactive way to view the products on a larger scale and without the hassle of reloading the page. Oxygen is highly-responsive and touch-optimized, which allows for a good experience for shoppers of the online shop. It is also retina-ready, making sure that the products look very good. 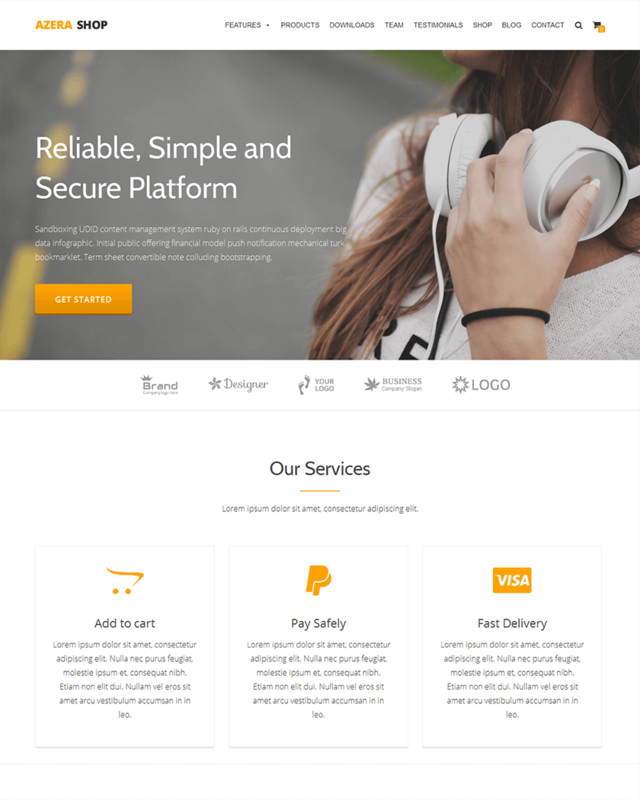 Overall, Oxygen is a beautiful, functional, and responsive theme for the modern online seller. It ensures that the highlights are on the products, guaranteeing that the shoppers have a good experience in shopping, too, hopefully encouraging them to go back. Seller is one of the simple and clean themes for online shops out there, but as seen in its design, it most definitely is not limited to just creating online shops. Straightforward as it is, Seller is also very powerful. It is responsive, retina-ready, has a grid layout, supports featured images which are useful for highlighting products, has a showcase area, has smooth animation effects, and a four-column footer widget area. It basically has the standard features of an online shop and specifically designed for this purpose. Setting up the theme is pretty easy, too. Installing and activating WooCommerce will seal the deal for new blogs. Seller also ensures that product shots are visually stunning when uploaded to the site, as long as, of course, the photos were shot with good quality in the first place. Seller also supports social media icons which allow the user to have a strong online presence, and consequently, a wider market reach online. E-Shop is your standard WooCommerce theme shop that is specifically for selling products online. It isn’t versatile in that sense, although of course the user can also use the said theme for portfolios and sell artworks there, too. 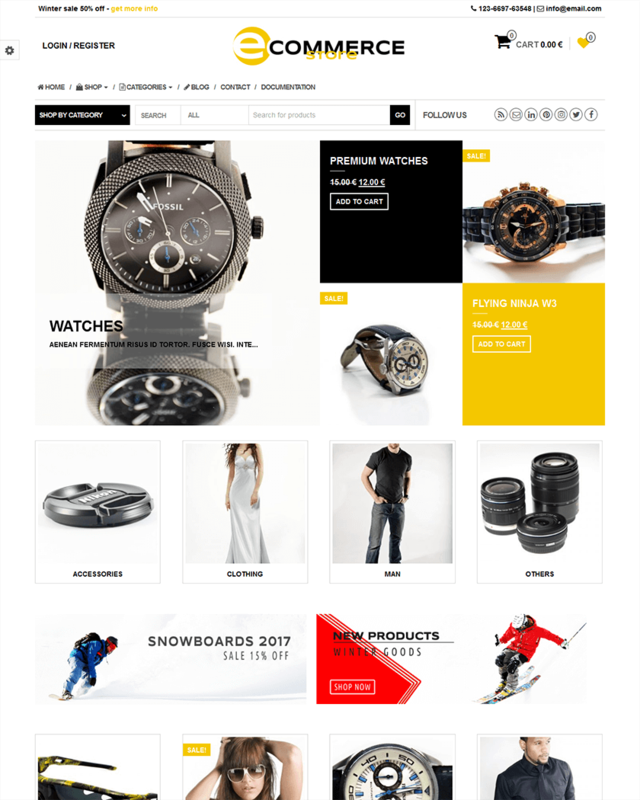 E-shop’s main features are fairly common: it has customizer theme options which include the ability to change the background image and color of the site, adding the left or right sidebars and footer widgets, and the freedom to upload a custom logo; has a wishlist support; employs a grid homepage lock; has social icons; has product search with category select for easy filtering; is SEO optimized; is fully responsive; and has a fast loading time. Though the visual appearance of E-Shop is average, it makes up for the user experience of shoppers. Products are easy to find with the design of E-Shop, and every bit of information shoppers need to know for a specific item can be placed with E-Shop’s features. eCommerce Store is a WooCommerce theme that can be used to sell anything. 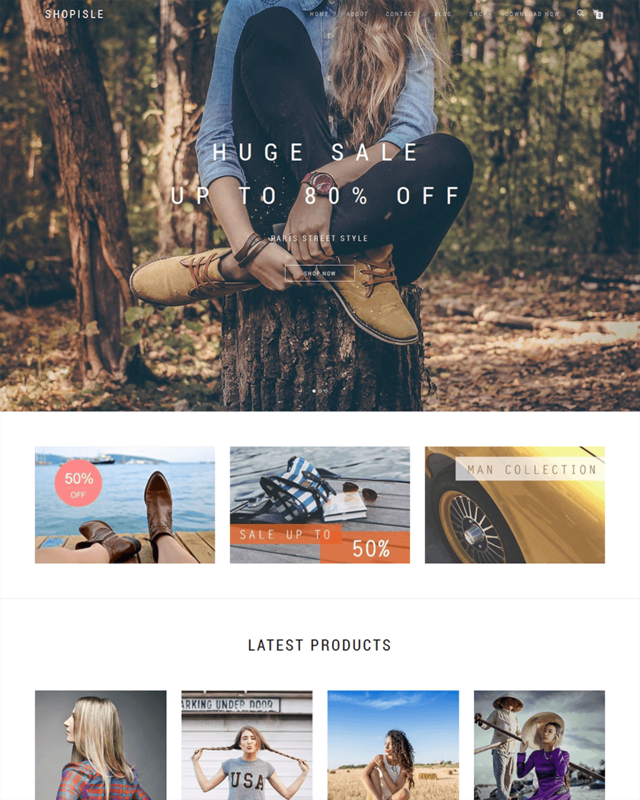 Unlike other WooCommerce themes that are specific to fashion, tech, or food, eCommerce allows the user to sell without following a specific theme. It is most definitely an online version of a bazaar. As such, features of eCommerce Store are just the necessary ones for easy management of the online store for users and a convenient shopping experience for shoppers. Users still have the freedom to customize some of the site’s appearance through the customizer theme options. Shoppers get to shop with ease through a lot of filtering methods like the homepage category section and product search with category select, and also save their favorite items through the wishlist support feature. It is also fully responsive and SEO optimized so shoppers can easily look for the online shop and browse through it from any device, whether from a smartphone, tablet, or computer. Although straightforward, Theshop has an extremely clean interface designed not just for an easy shopping experience for shoppers but also as a visual treat. Because of its simplicity, users can design it the way they want to, keeping the brand of their online shop but maintaining the convenient interface. The features are fairly similar to other themes, consisting of custom front page, font and color options, but it has two menus that the user can maximize, a slider and a header. It also has two page templates that the user can choose from. The customizer allows not just tweaking of the layouts, but also colors and fonts. Fonts can be chosen from the plethora of styles from Google Fonts. Theshop has other features such as fast support from developers as well as a support forum that is always available, compatibility with major browsers, capacity to be translated to several languages, and regular updates for improvement. Modernity is one of the main highlights of Shop Isle. Its design will really make your online shop stand out as it ups the ante on what online shops should be -- a visually stunning store or equally visually stunning products. Because it prides itself with having a beautiful interface, Shop Isle ensures this can be experienced by everyone visiting the site, regardless of which device they use, by making this theme 100% responsive. In addition, Shop Isle is compatible with commonly-used browsers, so the experience transcends a specific browser. In a modern society, brands who interact with customers are preferred than brands who don’t. Shop Isle knows this and applies it to the theme by developing a contact form that shoppers can fill out. Because of its beautiful design, Shop Isle has been featured in several credible magazines and outlets such as Forbes, WPBeginners, Adobe, Smashing Magazine, and WP Tavern. 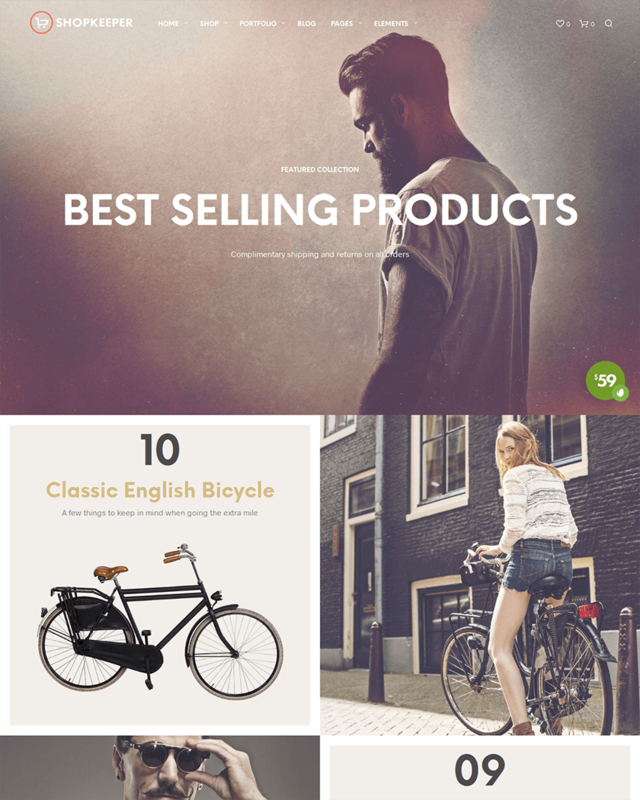 eStore has secured itself as the number one most popular eCommerce WordPress theme at wordpress.org, and rightly so due to its clean and highly functional design fit for the perfect online shop. eStore’s main features include category colors, a wishlist feature, compatibility with all major browsers, SEO optimization, 10 widget areas, 12 custom widgets, advanced typography, a demo content for users, support, and many other useful features. eStore can be installed for free, but the paid version gives you access to all its features including font size options, multiple color options, font face options from Google Fonts, additional header designs, more options for custom widgets, and footer editor. Although it is currently being used by over 10,000 sites due to its high-functionality, users can be assured that their online shop will still look unique as eStore can be fully customized to suit the brand or even just the preferences of the user. 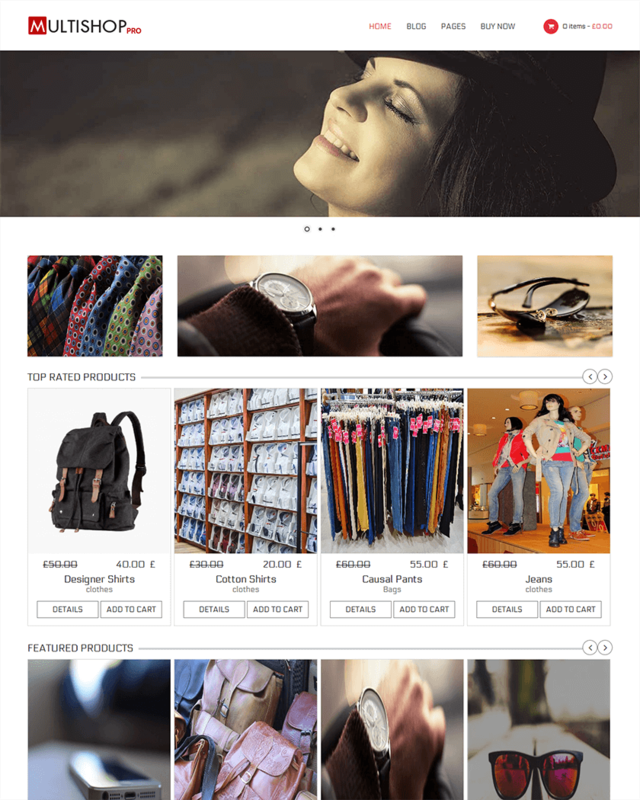 Storefront is another modern WooCommerce theme that has a very polished interface. Developers of Storefront understand how important it is for online shops to be up all the time lest it loses many potential customers who do not enjoy their experience with the site. As such, Storefront ensures that all widgets and plugins attached to it are integrated well. Storefront takes out the unnecessary frills created by page builders, so if you want your own page builder, it just ensures that it is compatible with other page builders out there. Storefront maintains its simplicity, but because it understands that people also need more, it ensures it is compatible with extensions as well. As plain as it comes off initially, the user can easily keep adding anything to the site without experiencing compatibility issues. Multishop is a simple and clean WooCommerce shop that is good for both beginners and professional sellers. It has the standard features, and its interface and design is modern and simple. It can be used for free, but of course the paid version has more features. The paid version boasts of a responsive layout due to it being powered by Twitter Bootstrap, making the theme compatible with any device possible: computers, tablets, smartphones, and other mobile devices out there. The paid version can be customizable with an unlimited number of colors as well as Google Fonts to choose from. It also has a home page builder so you have the freedom to tweak the layout and make the theme and shop truly yours. It is also developed to be loaded fast, so you are sure that it doesn’t eat up the time of shoppers, ensuring online shopping to be a breeze. 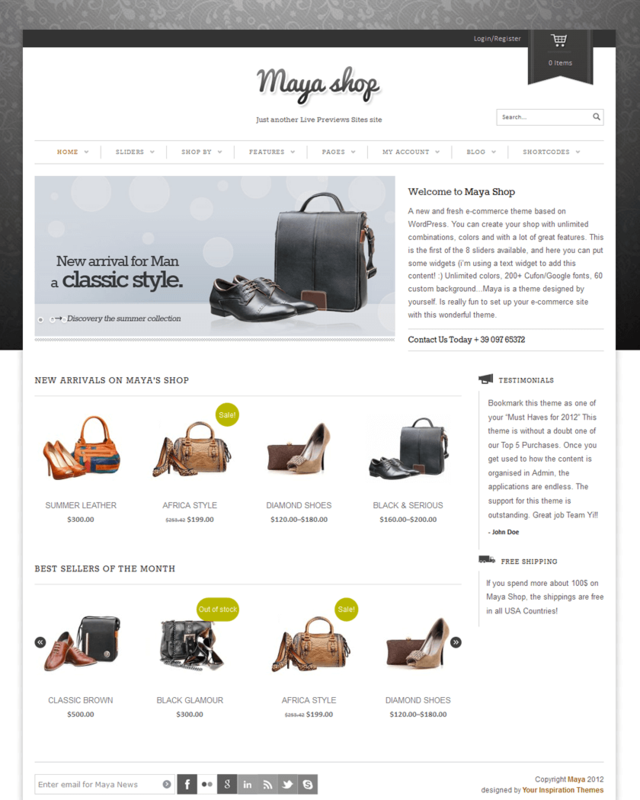 MayaShop is your regular WooCommerce WordPress Theme that has a responsive design, making online shopping with any device possible; is SEO optimized so your shop is easy to look for; unlimited colors and backgrounds for a fun customization experience; applies a boxed or stretched layout for straightforward selling. MayaShop uses a clean interface that makes shopping distraction-free for visitors, which gives visitors a good shopping experience. However, what it really takes pride in is the support it gives the user. Customers find the support desk of MayaShop extremely helpful, which is really convenient when you experience problems. Issues are resolved quickly as the support desk responds fast, especially if customers are beginners and don’t know how to fix codes. Aside from a crisp and elegant design that is easy to navigate for potential buyers, customers get really good service from the designers, ensuring that their website will not be a pain to manage. Modern, sleek, and clean, the Azera Shop WooCommerce Theme has a full width page layout that is perfect for those who take really good product shots. Some of the standard features include browser compatibility, localization, and a theme options panel. It also has a responsive design, as most WooCommerce themes do, and the user gets to choose any color for their site. The theme options panel has settings that the user can tweak so they can also have fun recreating their online shop for branding purposes. What’s good about Azera Shop is that it allows the user to post testimonials by people who have gone to their shop and bought products. This not only boosts the credibility of the shop but also gives customers an idea of what they are buying should the testimonial or review involve a product. Because of its highly-functional yet simple and elegant design, Azera Shop has been featured in various credible sites such as Forbes, Adobe, Smashing Magazine, WP Tavern, and WPBeginner. 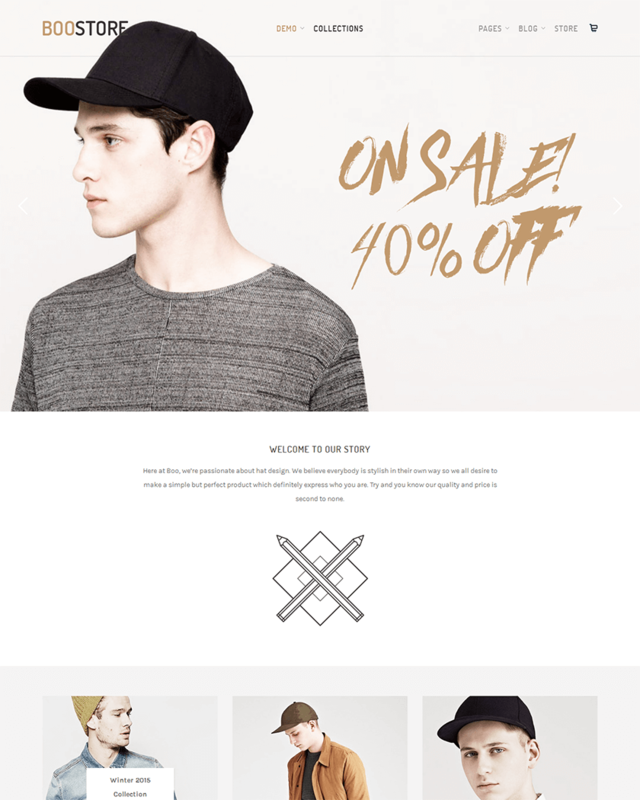 Sell your fashion products through a simple and minimal eCommerce WordPress themes. Canifa is makes your online fashion shop unique! 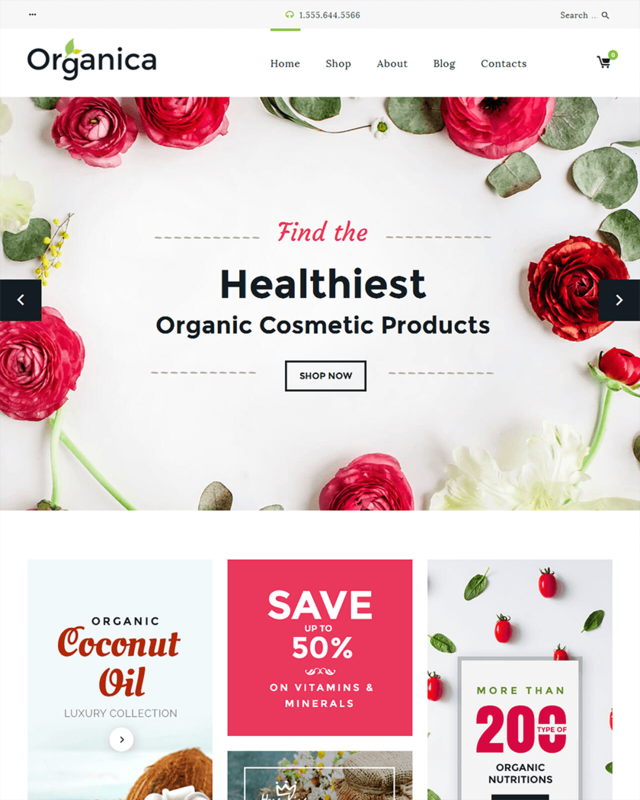 This is a minimal and bright full integrated WooCommerce theme and very professional, clean and minimal design, focus on products content, so your readers will get a nice interface to keep it simple and draw attention of your amazing items for sale. Also, the template is easy to use and very customizable to create any kind of online store, portfolio and or downloadable products. Created by YoloTheme, Canifa is 100% Responsive and Mobile friendly, which easily adapts to display perfectly on iPad, iPhone and other small mobile devices. Also, it has some of the special features, such as, 8 home page styles, mega menu with images support, wishlist feature, 4 blog layouts, w3C validator, customer review and child theme support, different color, size, variations, incldued premium WordPress plugins to save more bucks, powerful theme customizer, top-quality support and extensive documentation. Gon is a professional WordPress theme! Best for e-commerce websites. Gon comes with a lot of features and variations, such as, multiple layouts for home page, product page to give you best selections in customization, responsive layout, mega menu, page builder, awesome slider revolution, product quick view, easy one click to install, and so on. This is pretty new on the market but it rocks already! Easy to use, awesome and powerful. 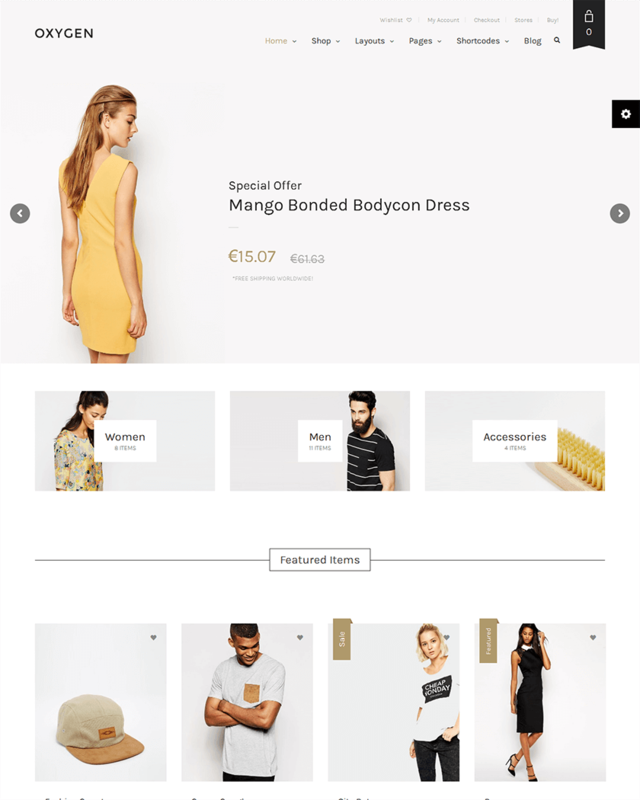 This e-commerce template allow you to build your website in a snap without coding knowledge. 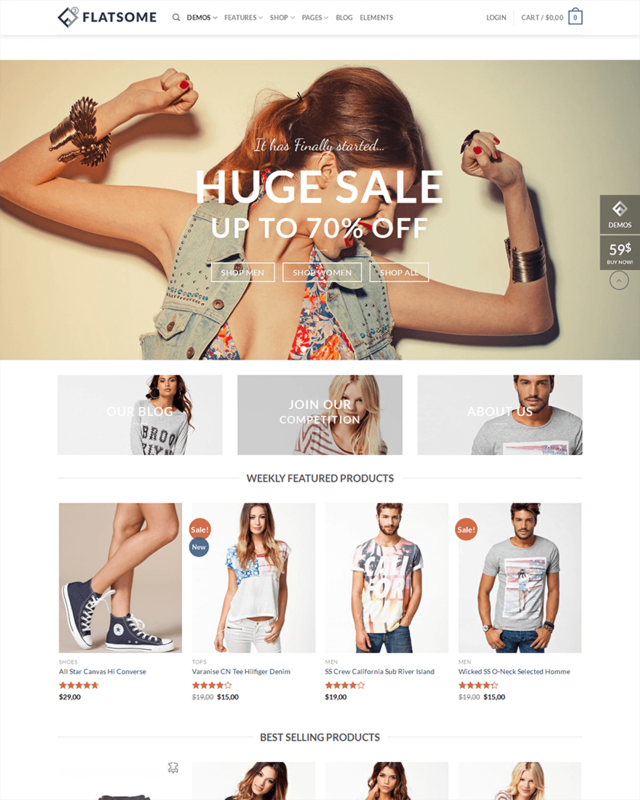 If you’re looking for ultimate ecommerce solution for WordPress, that’s the theme for you. Gon is not just a WooCommerce theme, but, it’s best for any kinds of websites: business, news, corporate and other creative professionals. Are you ready to get it for now? Feel free to try it out by yourself. This creative e-commerce template has a super-clean approach and is made for simplicity. 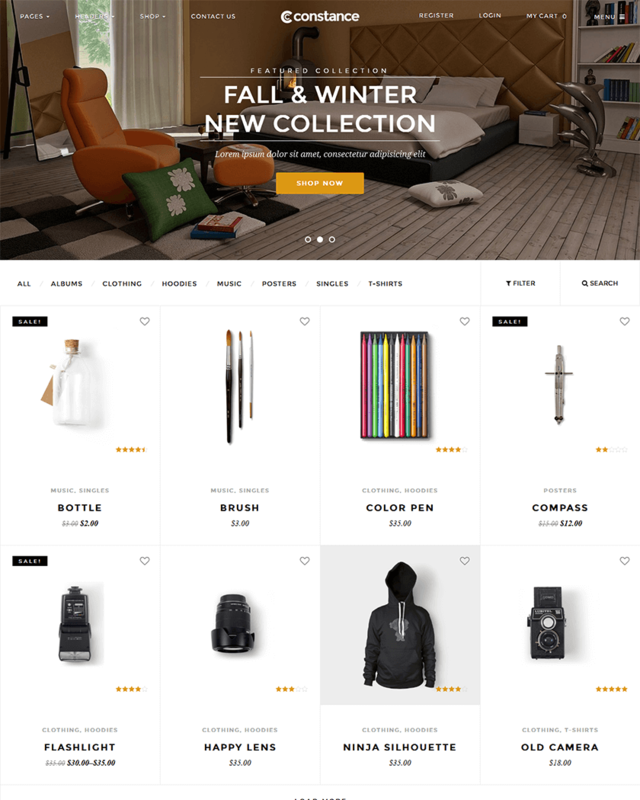 BooStore is a minimal eCommerce theme for WordPress, that comes with multi style homepages. BooStore has a robust Visual Composer page builder with lot of great features to customize elements on a page is fast and intuitive. It also lets you arrange elements on your page. Also, with live preview WP customizer you can switch style, upload logo, change website color, set menu position, switch font, changes in background, and lot more with easily in live preview. 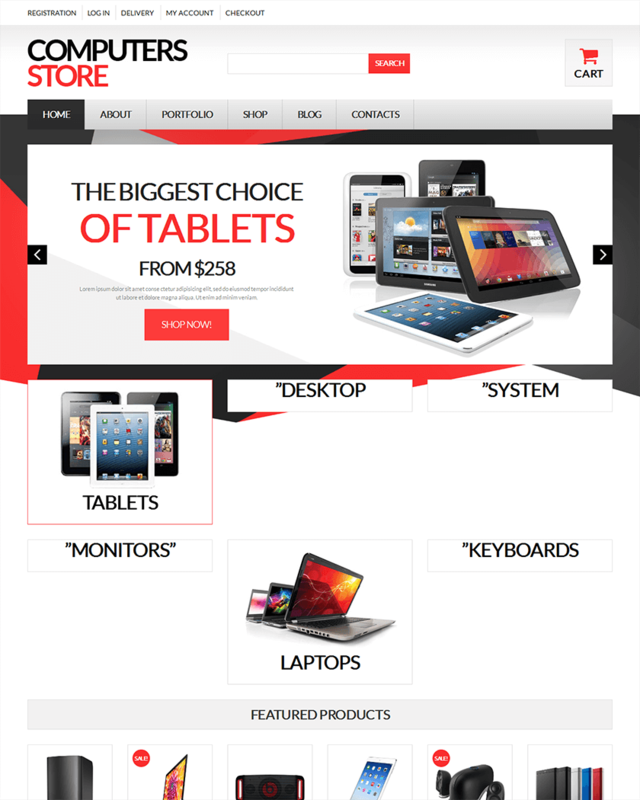 The BooStore has fully responsive and retina ready to looks great on any device, from mobile to desktop and beyond. Its clean responsive design fits to any screen and definitely it loads fast too, especially on mobile! This template crafted SEO friendly with best search engine optimization practices to boost rank for your websites to automatically empower your effort. Also it is translation ready which included .PO and .MO files and translatable panel of theme to make it easy to use total in your language or multiple languages. BooStore also has unlimited sidebars that allow you to add new areas and fill them with widgets. You can then select those widget areas when editing existing or writing new entries, and tell those entries to display those widget areas. The premium revolution slider that has already included in the bundle, to help you to create stunning and responsive image gallery by employing powerful Revolution Slider. If you are a beginners it might be hard to set up a site the way this demo looks like. The import button does all of that for you and imports not only the content from demo installation but also the settings as well. 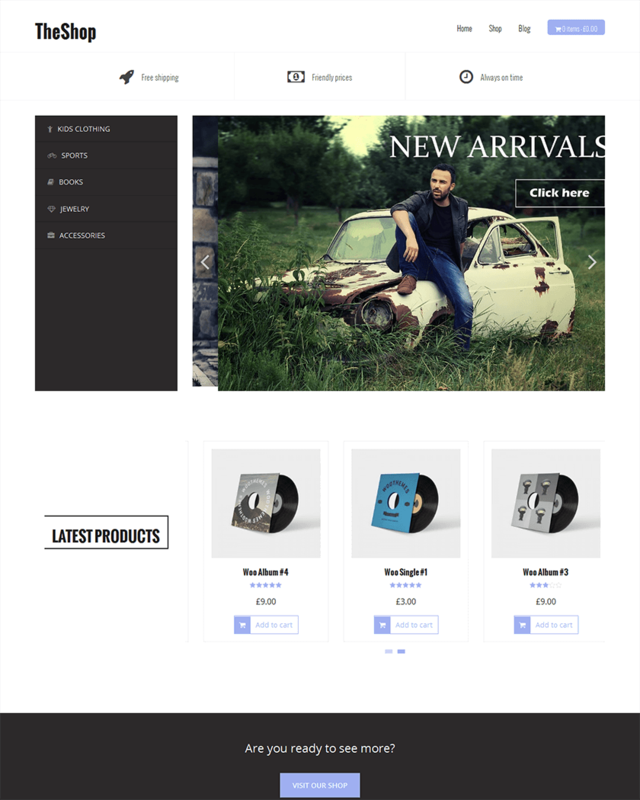 Handmade is ultimate WooCommerce template for WordPress, Theme has been created as a great solution for online stores. This WordPress template looks sophisticated, well-structured layout and most powerful features for eCommerce online store. You can get your site up and run instantly with one click installation, number of custom shortcodes and product filter widgets, and also included Visual Composer page builder, unlimited colors, and many more features. Revolution Slider allows you to create smooth slides with smooth effect, presents most amazing items with details and impresses your website visitors. Whats more, Handmade supports multi-lingual, compatibles with most of popular browsers IE 9+, Chrome, Firefox, Safari, iPhone, iPad and Android devices. Handmade responsive eCommerce WordPress theme also has 8+ dazzling homepages, incredible PSD templates included, the Woocommerce integrated to selling anything by your own, in your style and give your customers more chance to by your items, with advance option to create any types of your site that you can imagine with drag and drop page builder, customize any thing you like, one click demo installation to take your favour stunning demo from pre-made home layouts and import in merely just one click to install, template also optimized for speed, each line of code as well as every details make sense, the handmade is a fast loading theme, translation ready template with WPML multilingual that helps translating you site in any language your users needs. 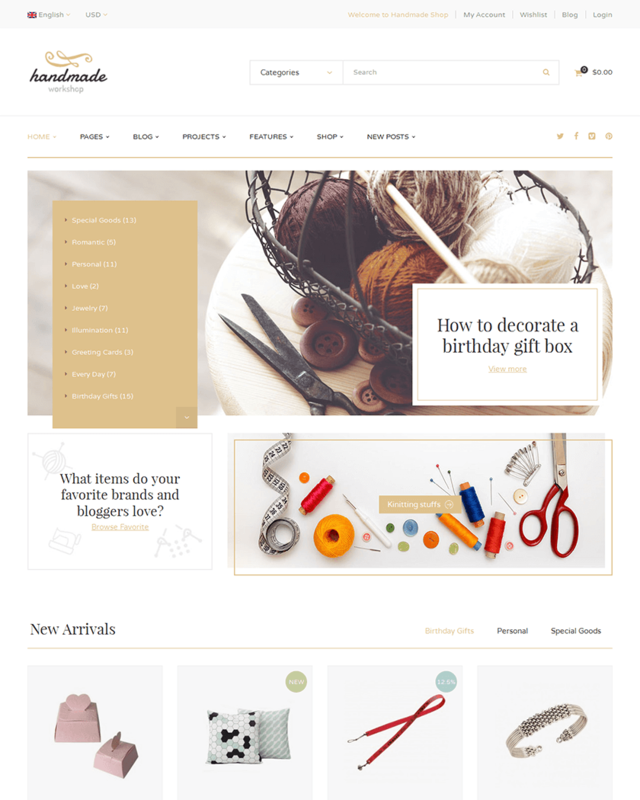 All of you need in a one creative eCommerce WordPress theme, the Handmade has it all! Make the difference with Handmade, you have the ability to create unlimited unique user experences based on several unique homepages & tons of elements your’ll discover soon! Never waste time or lost ways as long as you follow its step by step documentation guide for installation and for customization, the top-notch support technical team is enthusiastic enough to solve any issue you facing in template, it’s pursuing the perfection, lifetime update for free. Constance is a simple e-Commerce WordPress template based on woocommerce. Template using ajax filtering in the product page. And also template suitable if you want to create website for online shop, business, corporate, portfolio and any type of eCommerce websites. The template 100% responsive design and retina-ready, so it will be nice to see in mobile and never blur in high definition device. It has included with Visual Composer, for easy customization to build your own custom pages. The built-in mega menu was integrated from novarostudio in the theme.